JOHN CALABRIA was born on October 8th, 1873 in Verona. He was the seventh and last child of Luigi, a cobbler and of Angela Foschio, a maid-servant to the high-class people and a woman of great faith, educated by the Servant of God Fr. Nicola Mazza in his Institute for poor children. Poverty was his mistress right from his birth. After his father’s death he had to interrupt his 4th year of the Elementary School to find a job. The Rector of San Lorenzo, Fr. Pietro Scapini, noticing the virtues of this boy, prepared him privately for the admission examination into the Lyceum at the Seminary. Having passed his exams, he was admitted to and frequented the Lyceum as an extern. His studies were once again interrupted by a two-year military service. Charity was his lifelong characteristic. it is in this field that he distinguished himself mostly. In fact he served all, offering himself to do the most humiliating and courageous tasks. He won the heart of his fellow soldiers and of his superiors, and helped many to come back to the Church, and to practise faith. Having terminated his military service, he resumed his studies. One very special cold night of November 1897 – he frequented the 1st year of theology – returning home from a visit to the sick in hospital, he found a boy croaching on the doorstep of his house; he had ran away from the gypsies. Fr Calabria picked him up, took him in, kept him in his house and shared his room with him. It was the beginning of his works in favour of the orphaned and the abandoned boys. 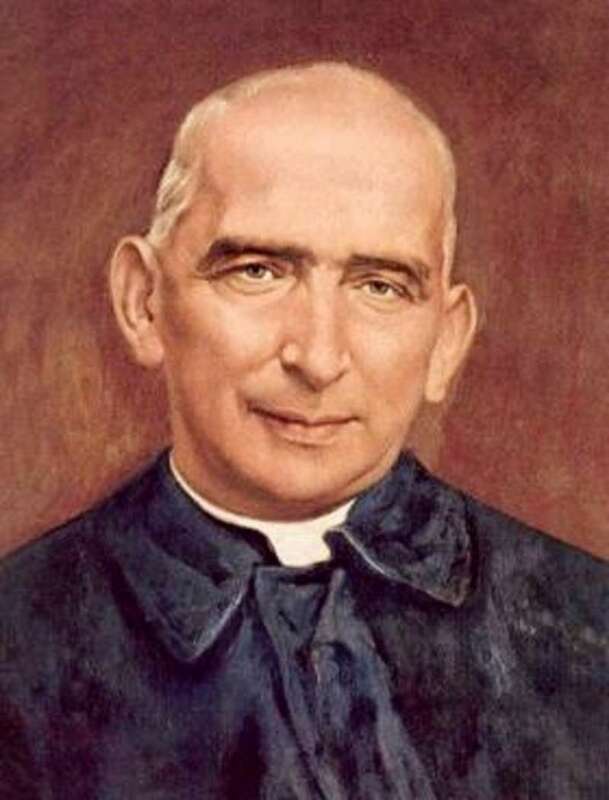 Saint Giovanni Calabria, 1873 – 1954, was canonized by John Paul II in 1999. Don Giovanni Calabria was the founder of the Poor Servants of the Divine Providence. 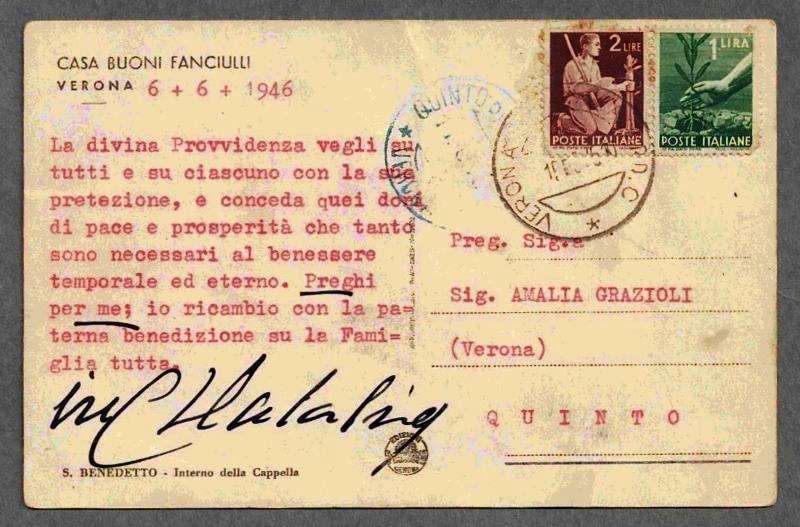 The 1946 postcard has a typed religious message signed in black ink by the Saint. It is a very rare signature. But for a few small defects, it is otherwise in good condition. Translation – We are asking the Divine Providence to watch over us and to grant us peace and prosperity, so necessary for the temporal and eternal well-being. Pray for me and I will bless you and your family with my paternal blessing. The post card is a rare addition to the Collection. A few months later he founded the “Charitable Institution for the assistance to poor sick people.” These were only the beginnings of a life characterised by charity. “Every instant of his life was a personification of St. Paul’s marvellous canticle on charity,” wrote a Hebrew woman-doctor in her Lettera Postulatoria to Paul VI about Fr. Calabria. She had been in hiding from the nazi-fascist persecution, dressed in a nun’s habit in one of his religious Institutes. After being ordained priest on August 11th, he was appointed confessor of the seminary and curate of St. Stephen’s Church. He devoted himself with particular zeal to hearing confessions, and to charitable works, helping in particular the poorest and the outcasts. 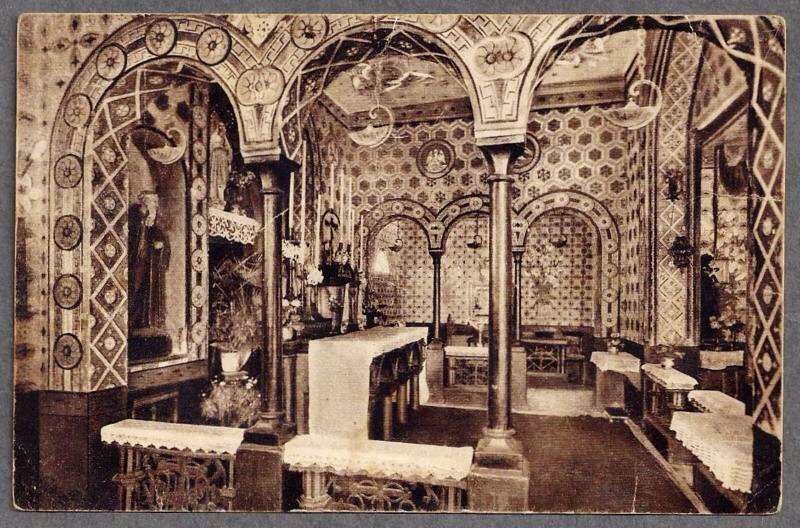 In 1907 he was appointed Rector of St Benedetto del Monte. He also welcomed soldiers in his house and cared for their spiritual welfare. 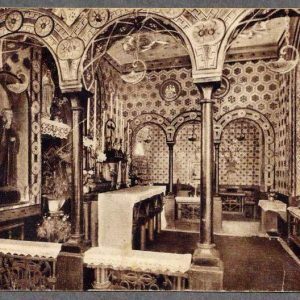 On November 26th, 1907 he founded the “Casa Buoni Fanciulli.” The following year it moved definitely to Via San Zeno in Monte. Today, their Mother House. Besides the boys, the Lord also sent him lay people, wishing to share with him the offering of their own life to the Lord. With this handful of men totally given to God in the service of the poor, with a life rooted in the Gospel, he revived the apostolic spirit of the Church in Verona. This nucleus of men was the foundation of the “Congregation of the poor servants of Divine Providence” which was approved by the Bishop of Verona on the 11th February 1932 and obtained Pontifical approval on the 25th April 1949. Immediately after the Diocesan approval, the Congregation spread out to various parts of Italy – serving the poor, the abandoned and the outcasts. It also extended its works to the elderly and to the sick, reviving them in the “Cittadella della Carita.” The apostolic heart of Fr. Calabria went to the faraway Paria in India when he sent four of his Brothers to Vijayavada. In 1910 he also founded the female branch “Le Sorelle” which later became the Congregation by Diocesan Right on the 25th March 1952 bearing the name of Poor women servants of Divine Providence and on the 25th December 1981 it obtained the Pontifical approval. To the two Congregations Fr. Calabria entrusted the same mission the Lord had inspired him with since his early priesthood: “To prove to the world that Divine Providence exists, that God is not a stranger, but that He is a Father, He thinks of us, on condition that we think of Him and do our part which is that of seeking first and foremost the Kingdom of God and His justice.” (Cfr. Matth. 6, 25-34). He shone Like a Lighthouse in the Church of God. These are the exact words that Blessed Cardinal Schuster had engraved on his tomb. In fact, from 1939-40 until his death, contrary to his inborn desire to remain unnoticed, he extended his horizons to the Church frontiers “proclaiming” to all that the world can only be saved by returning to Christ and to his Gospel. It was in this way that he became a prophetic voice, a point of reference. Bishops, priests, religious and the laity, found in him the sure guide for themselves and for their initiatives. In this context, the Bishops of the Episcopal Conference of Triveneto, in their Lettera Postulatoria to Pope John Paul II could write: “Fr Calabria, to prepare the Church of the year 2000 – a familiar expression of his, – made his life a suffering and grief-stricken appeal for conversion, renewal, at Jesus’ hour, with impressive accents and insistent urgency… It seems to us that Fr. Calabria’s life and his person itself constitute a “prophecy” of your passionate appeal to the whole world: “Aperite portas Christo Redemptori! “. He understood this radical and prophetic spiritual renewal in which even the laity could be involved. As a matter of fact in 1944 he founded “The Family of External Brothers” solely made up of laymen. He prayed, wrote, acted and suffered for the unity of Christians. In view of this he kept in touch with, protestants, orthodox and Hebrews: he wrote, spoke and loved but he never entered into discussions. He conquered everybody’s love. 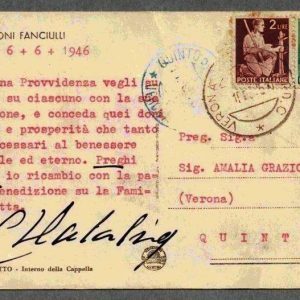 Even the Lutheran Pastor, Sune Wiman of Esklstuna (Switzerland), who had had several epistolary sharings with him, on the 6th of March 1964 in a Lettera Postulatoria to the Holy Father Pope Paul VI, asked that his venerable friend be glorified. And this was also the most mysteriously and sorrowful period of his life. It seemed that Christ had associated him to his agony in Gethsemane and on Calvary, accepting the offering of his life as a “victim” for the sanctification of the Church and the salvation of the world. Blessed Cardinal Schuster compared him to the Servant of Jahve. He died on December 4th, 1954. On the eve of his death he made his last act of charity offering his life to God for the dying Pope Pius XII. The Lord accepted this offer, for while he was dying, the Pope mysteriously and unexpectedly recovered and lived for another four years. Fr. Calabria was beatified by Pope John Paul II on the 17th April 1988, and canonized April 18, 1999.